I need to find a place to leave my luggage in lockers for 2 days in Frankfurt, either the airport (Terminal 1) or at the train station. I have to go by train to Stuttgart for 2 days without luggage. The luggage is 5 bags, 28 inches. There are lockers at Frankfurt Main Station (Frankfurt Hbf). You can leave your bags there. A small locker costs 3 or 4 Eur per day, a big locker costs 5 or 6 Eur per day. Note, that day ends at midnight, it doesn't matter when you put your bags in the locker - at 3:00 or at 23:00. You can also store your bag at the airport for up to three months. Here is the information about locations, prices and working hours. Not the answer you're looking for? Browse other questions tagged luggage-storage train-stations fra frankfurt or ask your own question. 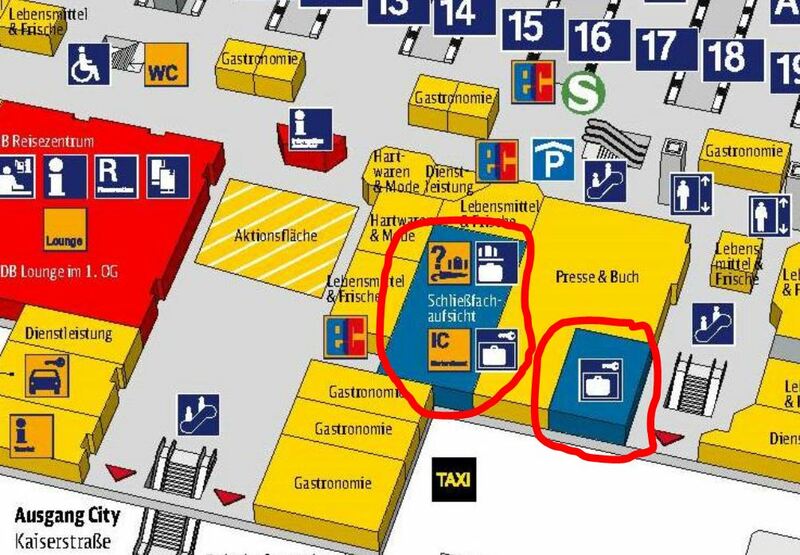 Does Frankfurt airport offer baggage storage reservations? Is there a website or resource with tips of places where to leave luggage? Are there any places to leave luggage in Brussels, for short and/or long periods of time?